Are you registered? Are you coming? It's going to be a super great day!! I surely hope to see YOU there!! 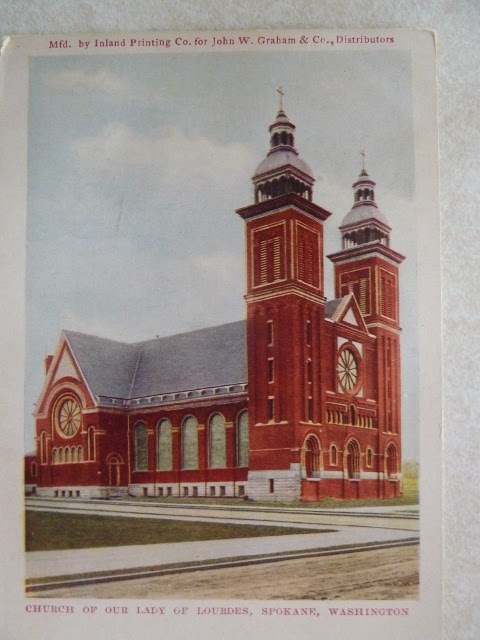 "In August of 1881, Jesuit Father Joseph Cataldo converted a carpenter's shop into the Church of St. Joseph, the first Catholic church in the Spokane Township. Like the smallest of seeds, the mustard seed, the Catholic faith here had humble beginnings. Only five people attended the first Mass in that wooden shed which measured just fifteen by twenty-two feet. Soon the seed sprouted and found sustenance in this soil. Five years later, a large brick church dedicated to Our Lady of Lourdes replaced the original structure, and a school opened under the direction of the Sisters of the Holy Names. The seedling's continued growth required an even more significant move. The cornerstone for the present church was laid in 1903. In 1906, the new school was completed. In 1913, this mustard seed became what the Gospels celebrate as the "largest of plants," when Our Lady of Lourdes became the Cathedral for the newly created Diocese of Spokane." I would guess that this postcard image dates back to about 1906? Do any of our EWGS members have stories about their ancestors attending this church?? I'll bet many of them did and over many years. In honor of Washington's Quasquicentennial Celebration (WA 125), this year's theme is 125 Years of Making History. Our regional branches are hard at work, promoting all things Archives, so check out what's happening at a branch near you in the coming weeks! *More workshops may be added as the month approaches. Contact the Northwest Regional Archives for more information! 20th - Common Core Tools for Teachers: The History Day Connection, 9:00 a.m. - Noon, Mt. 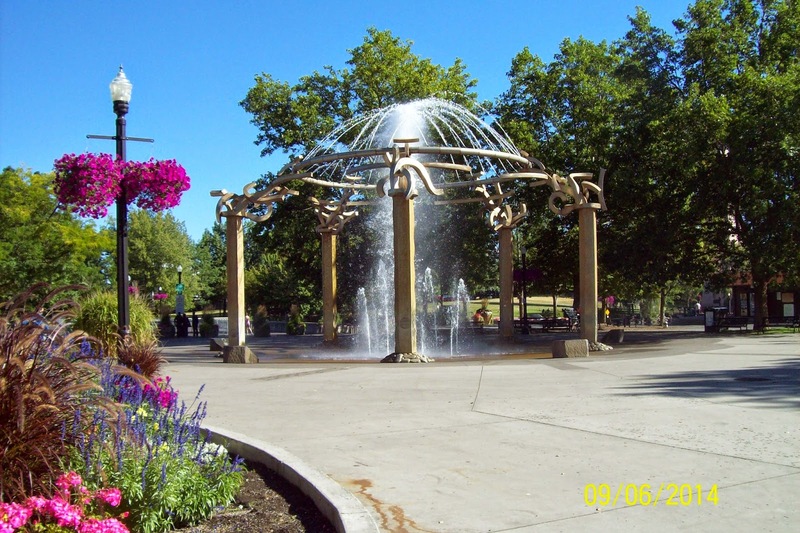 Spokane High School, Meade -- in conjunction with the Washington State Historical Society - 3 Clock Hours Provided free of charge! 2nd - Information/Resource Table--Educator Night at the Museum--LeMay Auto Museum in Tacoma, 5:30-8:00 p.m.
Join us at the State Archives in Olympia to celebrate Archives Month with a series of brown bag lunch sessions on Thursdays in October! These sessions will feature records in our collections that may help you with your genealogical or historical research. All sessions are from 12:00-1:00 p.m. at 1129 Washington St. SE, (The Southwest Regional Branch and State Archives) in the conference room. Contact the Southwest Regional Archives for more information. 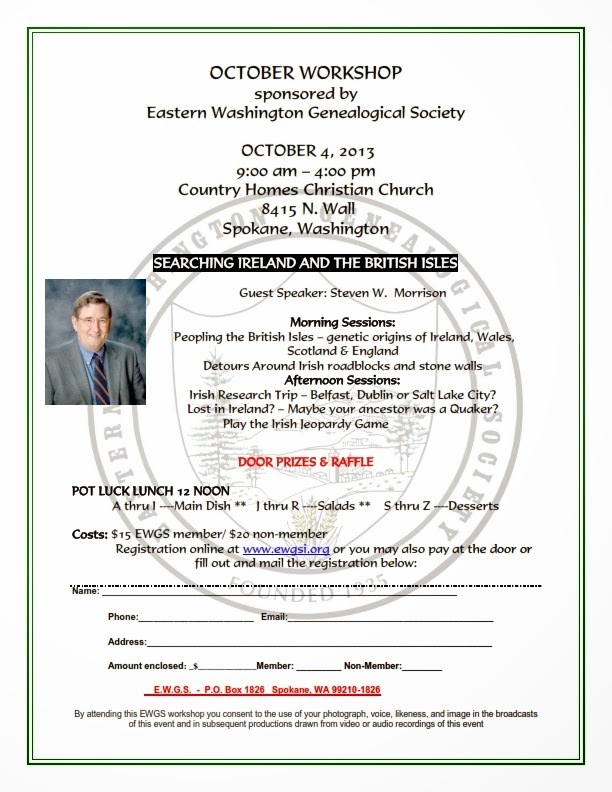 9th - Brick Wall Session with the State Archivist--are you working on a genealogy project and have hit a brick wall? Come in and talk to Steve Excell, our State Archivist, to get some hints and tips! 16th - Vital Records--Learn about what vital records are available at the State Archives and how to use them to find additional records. 23rd - Land and Property Research--Learn about how to research a property's history with records from the Archives. 30th - Linda Hazzard--Come and learn about this self-proclaimed holistic healer and her subsequent murder charge from the turn of the century. Just in time for Halloween! Feel free to bring a lunch...and your questions! 11th (Tentative) - The Eastern Regional Branch and Digital Archives are planning a Saturday Open House Event, with tours and presentations on how to use the Digital Archives, what's new on the DA, and how to access the Eastern Regional Archives records. Details to follow, but it will likely be held from 10:00 a.m. - 1:00 or 2:00 p.m. The focus will be on the Expo '74 slides and records in the collection, as it has been 40 years since that landscape-changing event took place in Spokane! For more information as the date approaches, contact the Eastern Regional Branch. Central Regional Branch to host Volunteer Recognition Event! 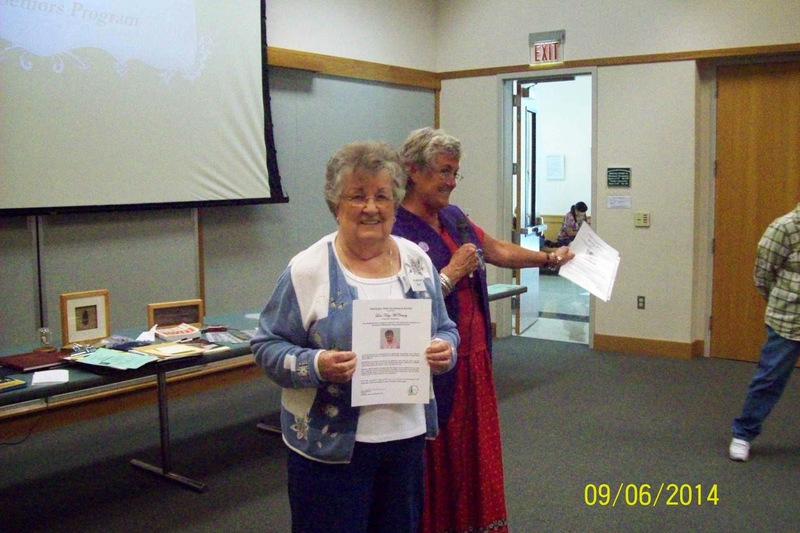 Each year, the Office of the Secretary of State hosts a recognition event to thank volunteers. This year, on October 7, we'll be in Ellensburg at the Western V.I.P. Room at the Kittitas County Events Center. As part of this exciting day, the Central Regional Branch will open its doors at 1:30 p.m. for a behind-the-scenes tour! Designed for staff of libraries in Washington, this free web presentation lets attendees share their skills and successes, while learning about new topics. Join Legacy Washington and the Washington State Archives as they educate us about our history, and how to locate and access the historical resources available through these two sources. The Historical Records Project recruits volunteers to transcribe and index records, making them searchable on the Digital Archives. Volunteers work from home. 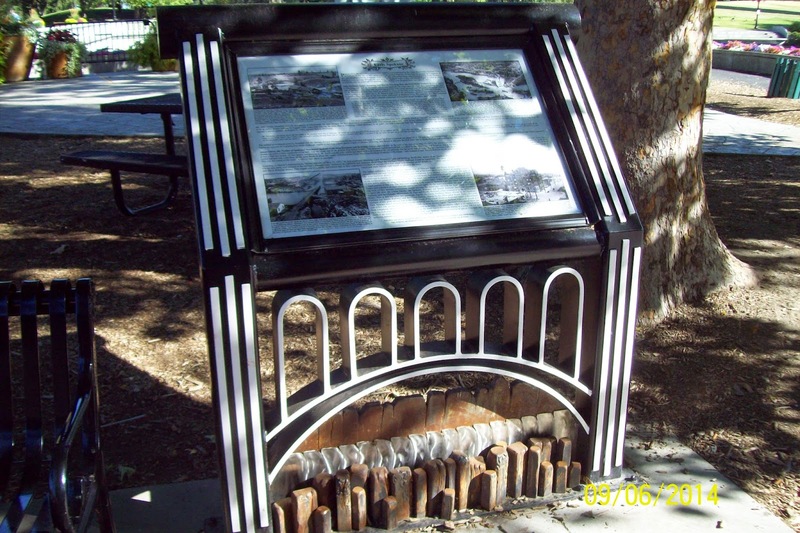 Get involved today, and be a part of preserving Washington State History! "Whether you are a beginner of have already started exploring your family tree, learn to use online genealogy resources for research. Discover tricks and frugal tips to expand your research and stretch your budget. A working knowledge of the computer and Internet is required. All classes are held at the Magnuson Building, 2917 W. Fort George Wright Dr., Room 148." Find more information and register at www.sccel.spokane.edu/ACT2 or call 509-279-6030. Miriam is a knowledgeable and energetic teacher of genealogy subjects and just completed the course to become a Certified Genealogist; you will enjoy and learn from her classes. EWGS & KSPS .... again a successful partnership! 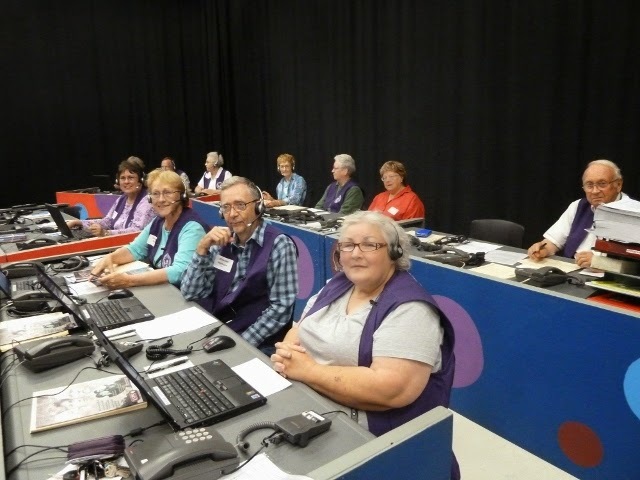 On Monday evening, September 8th, eleven EWGS members gathered at the KSPS-Public TV station on South Regal to take pledge calls for PBS and to enjoy each other's company for the evening. Cheryl Beck is our "great leader" who coordinates all the arrangements between EWGS and KSPS. Here is our official KSPS station group photo. Don't we look good in our EWGS vests? One of the programs airing that evening was a remembering music of the 1950s and 1960s. I polled the group asking their favorite singer: Cheryl-Paul Anka; Dani Lee- Tennessee Ernie Ford; Janette-Ricky Nelson; Pat-"too many to say! "; Tony-Roy Orbison; Jeanne- "too many to say! "'; Dianne-Everly Brothers; Evelyn-Elvis; Doug-Kingston Trio; Oweta-"too many to say!" I would have to say that my favorite singer is from the 1970s: John Denver. We enjoyed a fun evening and I'm sure did a good job for our public TV station. 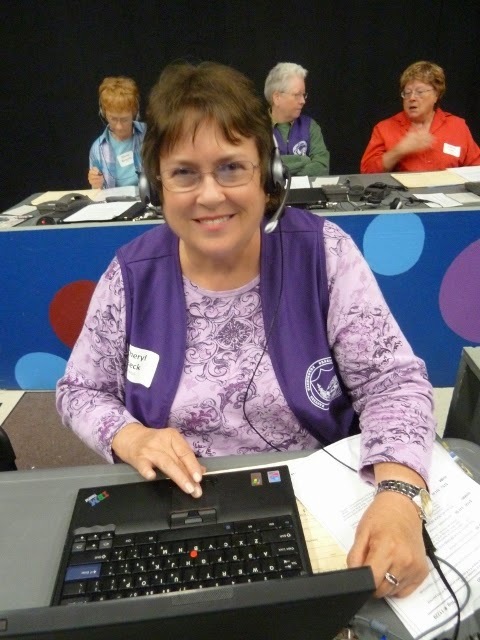 I hope when Cheryl Beck puts out a call for volunteers for the next pledge-call-taking-event that you will want to join the group. When my father died in 1973, I found in his belongings an old sepia-colored photograph of a stark desert setting. The most conspicuous features were a pair of low hills, distinctive mainly because the surrounding area was so flat. Clayton, New Mexico. Nothing on or with the picture indicated where it was taken, but I suspected it was in the vicinity of Clayton, an area which Dad sometimes mentioned. A year ago, I found myself driving through that area. I’d spent a couple of days poring over records at the Dalham County Courthouse. I’d also located my great-great-grandparents’ graves at the Texline, Texas, Cemetery. After all that searching, my wife and I were headed west, out of Texas, and braced for a full day’s drive to Salt Lake City. Then something caught my attention. The unwavering horizon had a slight deviation after all. The closer we got to Clayton, the more clearly a couple of mounds stood out, making a memory flash appear in my mind of that old photo of my Dad’s. When the hills were close enough to register a strong match with the image in my head, I pulled over and took a picture. 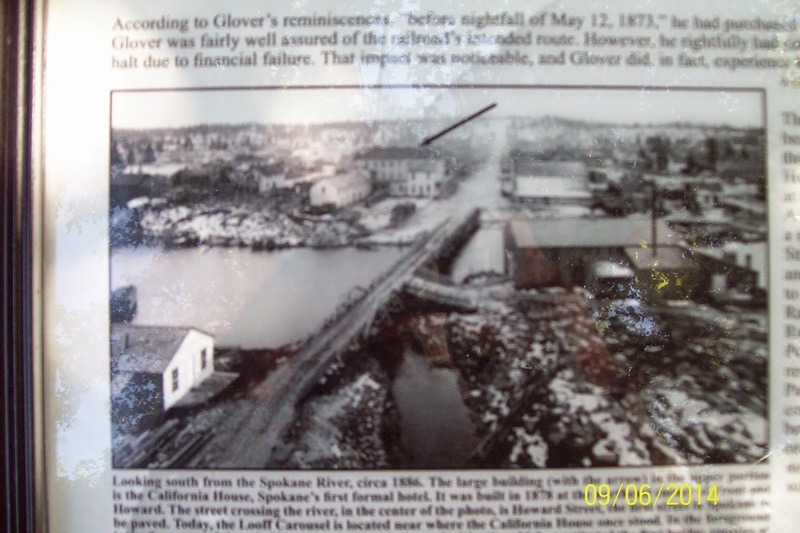 Back home in Spokane, I dug out Dad’s photo and verified that I had located the same place. A little time with Google filled in some blanks. The early Spaniards called the two hills Orejas de Conejos, or Rabbit Ear, and when the Santa Fe Trail became a significant route from Independence, Missouri, to Santa Fe, New Mexico, the Rabbit Ear was a landmark that alerted wagon trains to a surprisingly good supply of water, food and grass. In the 1920s, my father and his family pushed on to the Pacific Northwest with its towering mountains, so different from the flat monotony of the Great Plains. Dazzled as he was by the Cascades, my father found enough meaning in his memories of the Rabbit Ear that he held onto that photo the rest of his life. I probably will too. 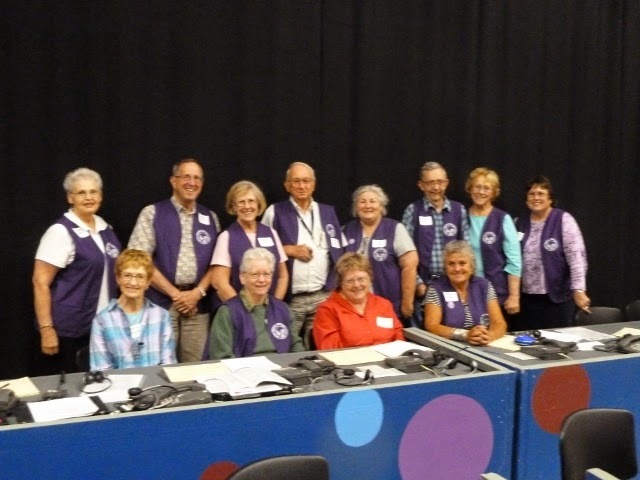 Probably one of the best reasons for joining a genealogical society is the people you meet, and the volunteers that help run the society are the best. So I was glad when EWGS nominated Lola McCreary for the Volunteer award that WSGS gives out at their annual meeting. Sadly Lola did not attend this years meeting so here she is receiving her award from WSGS vice president Donna Potter-Phillips. 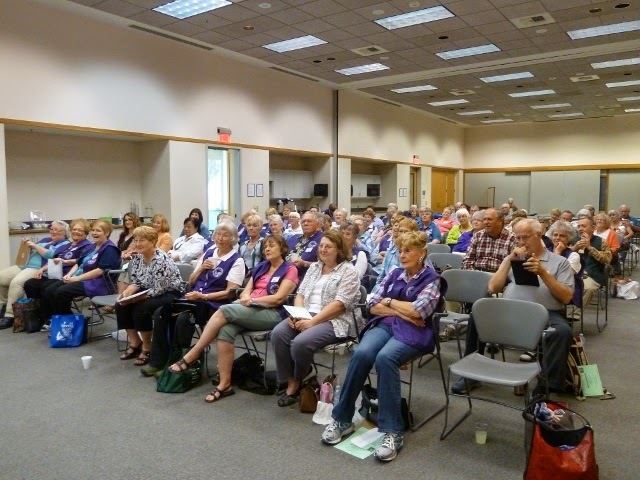 There was a goodly September crowd that turned out for the 6 September 2014 EWGS meeting. 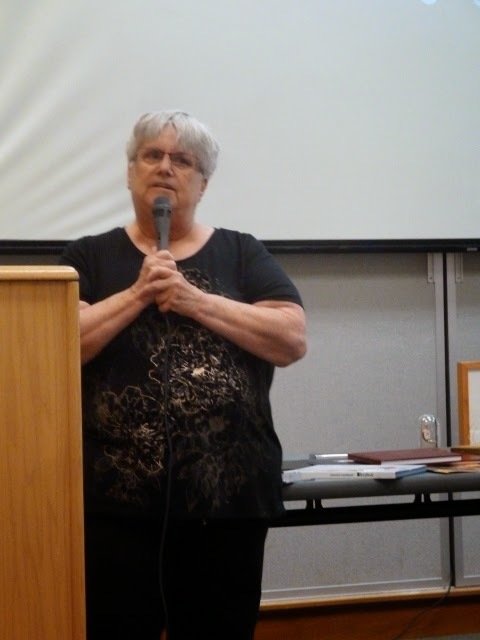 Speaker Ann Corwine explained her Family Heritage classes (offered through the local college's seniors program, Act 2) and gave tips and how-tos for preserving our family histories. Several new EWGS members and many visitors were introduced and committee chairs gave reports on their groups' activities. 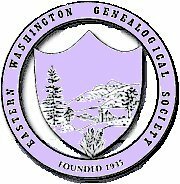 EWGS is a triving, growing, most worthwhile group! Visit the EWGS website: www.EWGSI.org and sign up (look to right of screen) to receive notifications of new posts to our EWGS blog. 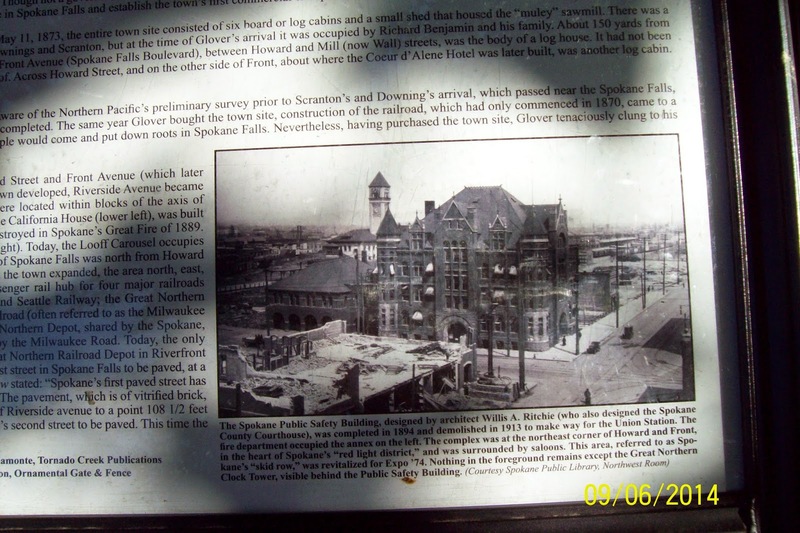 Here is a close up of the city hall that was built here in 1894 and torn down in 1913 to build the Union Pacific Railroad depot. 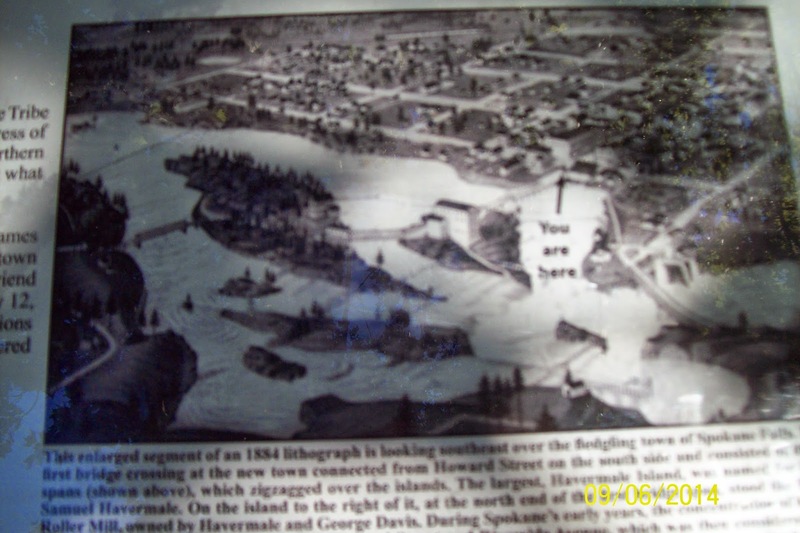 They also have a picture that shows what this spot looked like from across the river about 1900. Another view from across the river. The dedication picture in the magazine included 4 persons: Tony and Suzanne Bamonte, Chuck King and EWGS member Doris Woodward.